Forty years after the first Earth Day, the world is in greater peril than ever. While climate change is the greatest challenge of our time, it also presents the greatest opportunity – an unprecedented opportunity to build a healthy, prosperous, clean energy economy now and for the future. 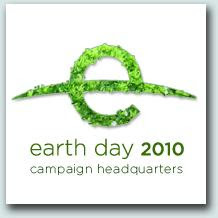 Earth Day 2010 can be a turning point to advance climate policy, energy efficiency, renewable energy and green jobs. Earth Day Network is galvanizing millions who make personal commitments to sustainability. Earth Day 2010 is a pivotal opportunity for individuals, corporations and governments to join together and create a global green economy. Join the more than one billion people in 190 countries that are taking action for Earth Day. Drink from a glass at work. NO MORE [PLASTIC] WATER BOTTLES. Turn off tap water while brushing your teeth. Use green products that will change consumer behaviour in a positive way. Stop wasting the resources and bring upon their maximum utilisation. Turn off all lights when not in use. Say no to waste! Go green!